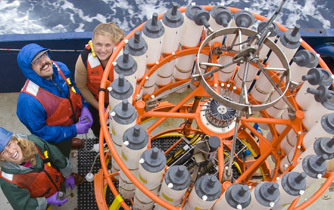 ProjectWHOI is the crowdfunding platform that lets YOU be on the cutting edge of ocean science. Curiosity and a drive to solve some of the world's most pressing problems are what fuel us at the Woods Hole Oceanographic Institution. But cutting edge science doesn't happen for free; it can be difficult to get promising new ideas off the ground. That's where YOU come in—we need you to help us get our ideas in motion. While we don’t have a current crowdfunding campaign underway, WHOI scientists often take calculated risks—testing new theories, exploring undiscovered areas, and developing innovative technologies. Join the growing community of people who are passionate about understanding our changing ocean by making a gift today. By providing your email, you agree to receive periodic communications from the Woods Hole Oceanographic Institution. You may opt out any time.